Other Notes: 2015 version. Seasonal bottles and kegs (released October). Malt – Pale Ale, Golden Promise, Aromatic, Chocolate, Black, Special B, Medium Crystal, Roasted Barley and Flaked Oats. Hops – Warrior, Amarillo and Simcoe. Brewer Description: (from website) This massive Russian Imperial Stout brings waves of flavor; chocolate, cherries, raisins, coffee and toffee, finishing with a non-traditional dose of aroma hops. 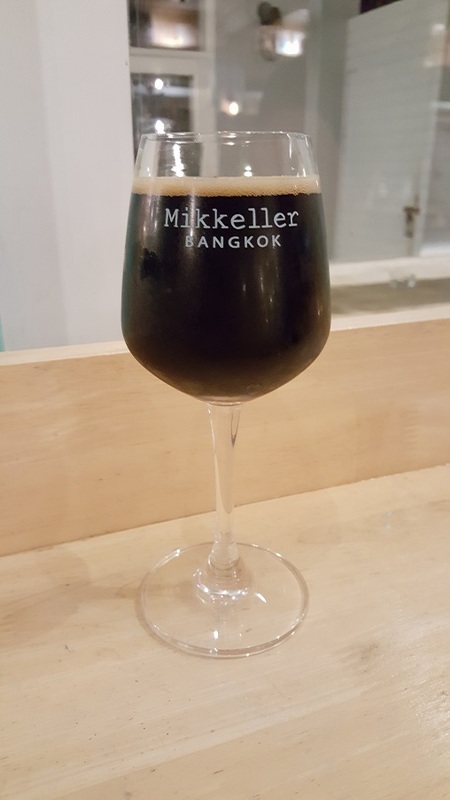 Intro: A 200ml pour on draft of the 2015 version at Mikkeller Bangkok into a mini stemmed Mikkeller tasting glass. Appearance: It was pretty much pitch black with a half finger beige head that dissipated fairly quickly, leaving sparse lacing. Aroma: Chocolate, vanilla, roast and hints of dark fruit. Taste: Dark fruit, plum, prune, chocolate, roast, vanilla and caramel. Mouthfeel: Rich, creamy, full bodied with light carbonation. Overall: This was so good. Really nice aromas and great flavours. It’s a sipper, but the dark fruit, chocolate and caramel works well. Other Notes: Malts – 2-Row and Golden Naked Oats. Hops – Warrior and Citra. 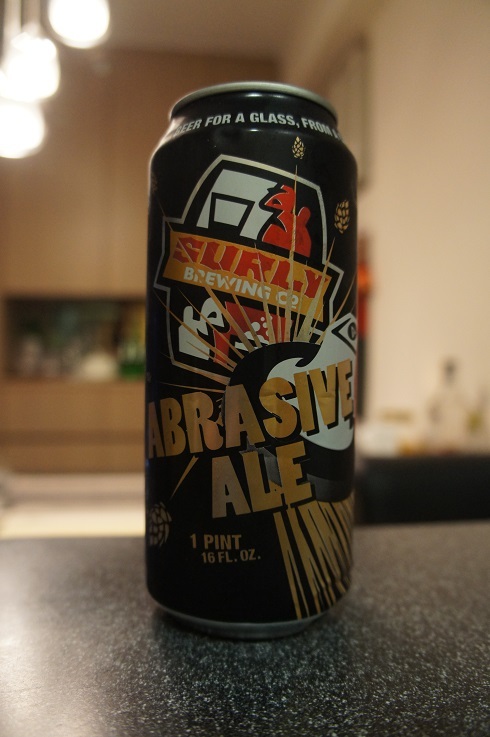 Brewer Description: (from can) Sure we’re abrasive. We were abrasive long before we were Surly. If you visit the brewery you can still see remnants of the industrial manufacturing factory Omar’s parents ran for 35 years within those same 4 walls. Bandsaw blades, grinding wheels, and sanding discs came long before ales and lagers. But let’s be honest, this is a lot more fun. 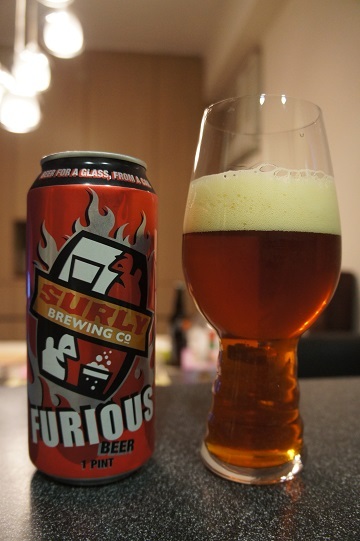 Pale in color, this over-hopped, under-brewed Double IPA has almost twice the amount of hops & malt crammed in the can. 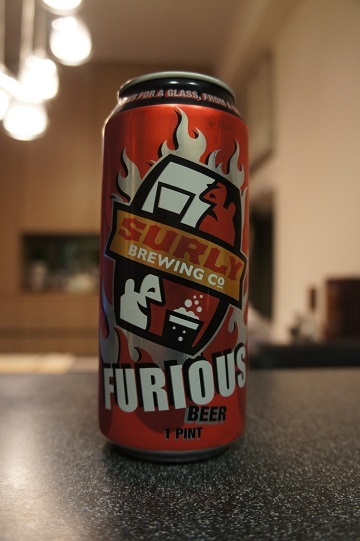 Intro: A 16 fl oz can canned on 3rd December 2015 and poured into a Spiegelau IPA glass. Appearance: It poured a slightly hazy golden orange colour with a slightly less than three finger off white head that had good retention and left nice lacing. Aroma: Strong mix of tropical and citrus fruit with mango, pineapple, orange, grapefruit and pine. Taste: Lightly sweet, candied orange, pineapple, orange zest, grapefruit pith and pine. 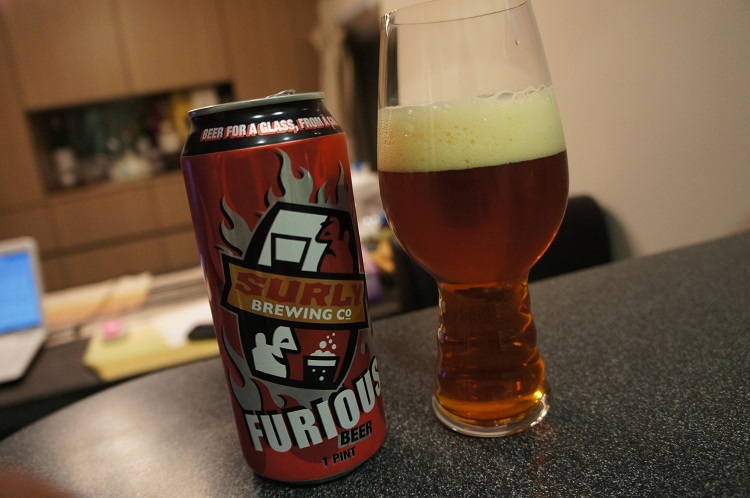 There’s some interesting caramel and light spiciness mixed in on the finish. Overall: This was a very nice DIPA with a good tropical and citrus punch and just a touch of sweetness which is nice. I would love to be able to try a fresher can. 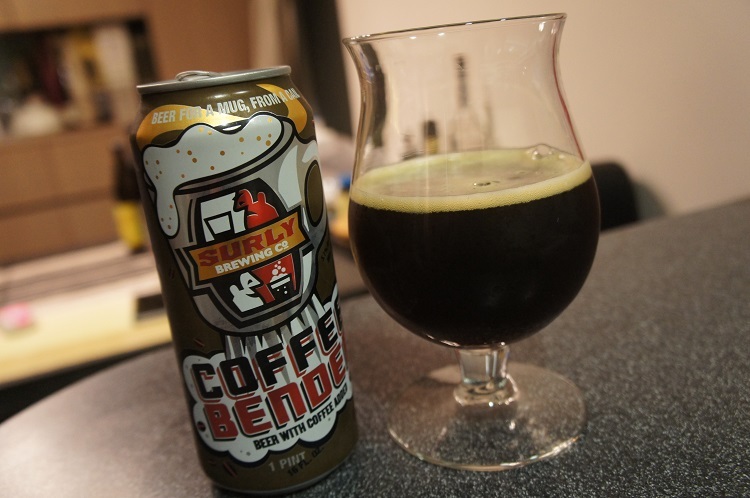 Brewer Description: (from can) Coffee Bender refreshes like an iced coffee, is aromatic as a bag of whole beans and satisfies like you favorite beer. 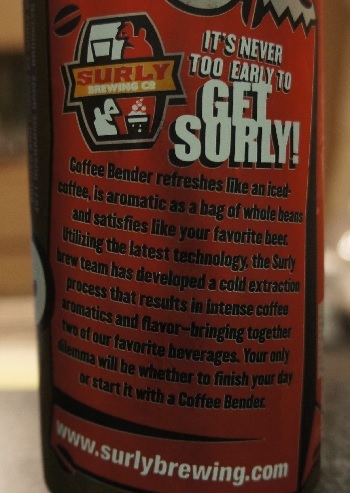 Utilizing the latest technology, the Surly brew team has developed a cold extraction process that results in intense coffee aromatics and flavor – bringing together two of our favorite beverages. 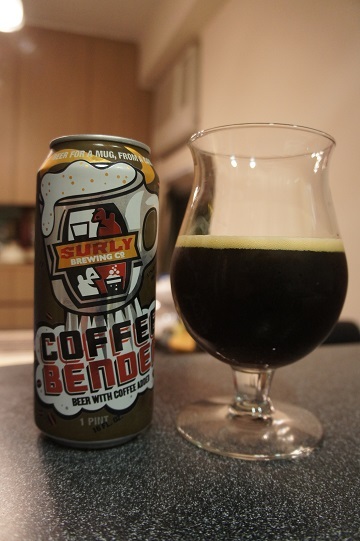 Your only dilemma will be whether to finish your day or start it with a Coffee Bender. Intro: A 16 fl oz can canned on 2nd July 2015 and poured into a Duvel tulip glass. Appearance: It poured a clear dark brown colour much like a French pressed coffee. There was a one finger tanned head that dissipated quickly but leaves some nice stringy lacing. Aroma: Like a fresh brewed cup of coffee from freshly grounded coffee beans with a hint of vanilla and brown sugar. Taste: Roasted coffee, coffee grounds followed by some nuttyness with a hint of milk and vanilla. 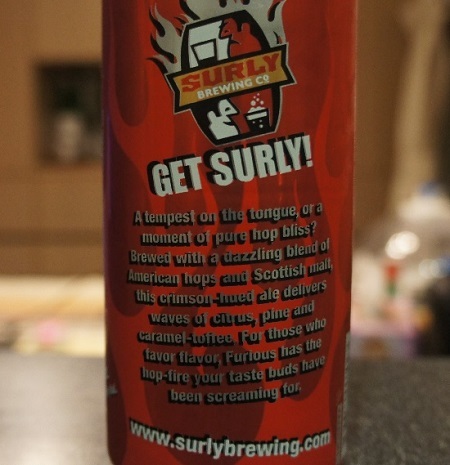 Mouthfeel: Creamy, medium bodied with medium carbonation. 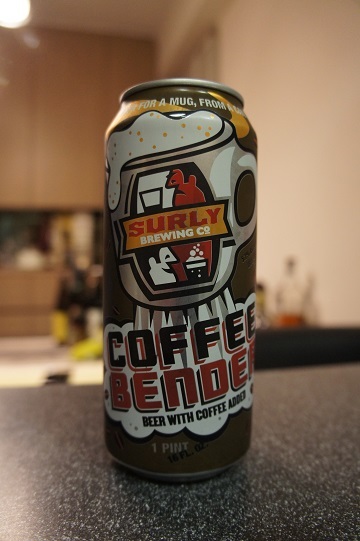 Overall: A very good brown ale with nice coffee flavours. Very easy to drink especially if you like coffee.